Kulfi is undoubtedly India's most desired sweet dessert which is creamy & delicious ice cream. Best to have in summers so beat the heat with this Barfi flavoured kulfi. Simmer milk in heavy bottomed kadai. Keep on stirring the milk and cook till it thickens and quantity is reduced to half. Once quantity is reduced, add mashed khoya barfi . Cook for 5 min. Mix kesar in hot milk and add into mixture. Add sugar as per taste and cook for 5-10 min. Allow the mixture to cool down completely. Blend it using blender and churn to form a thick icecream. Keep the mixture in freezer till semi solid. Churn the mixture again. Repeat this procedure 2-3 times to avoid forming ice in the kulfi. Set the kulfi mixture in kulfi mould. Add few rose petals in the moulds. Keep it in freezer for 7-8 hours till Kulfi is completely set. 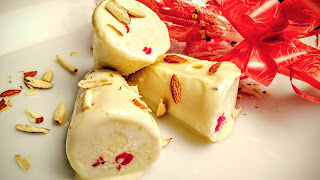 For serving, de-mould the kulfi and garnish with sliced or chopped nuts. lovely,delicious kulfi. rich, creamy and delicious.